Kenneth B. McMillen, Associate Professor of Political Science at West Liberty from 1946-1980, is remembered below by alumnus John Hoppers ’63. McMillen earned his A.B. 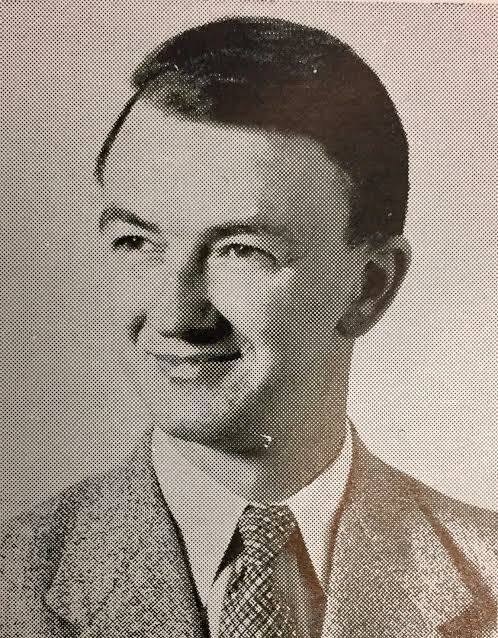 from Fairmont State in 1941 and M.A. from West Virginia University in 1947. He did additional graduate study at The Ohio State University and eventually became Chair of the Department of Political Science at West Liberty. Kenneth B. McMillen is involved in many of my fondest memories on the Hilltop. I still have visions of Ken sitting cross-legged, yogi-style, on top of his desk telling stories of being attached to Gen. George S. Patton’s staff in World War II, or leaning against the wall outside his classroom puffing on a Chesterfield. Life seemed much gentler back in the late 1950s and early 1960s when all we really had to worry about was finding a few dollars to fill the tank at 23 cents a gallon, pay 15 cents for an egg sandwich at the Union, or hitch a ride to the Bucket. In those days, at the height of the Cold War, there was always the threat of a nuclear attack. The Pittsburgh-Youngstown-Wheeling industrial triangle was a definite target but that was far away and we were living in the present, as college students are intended to live. Current events always had a way of slipping into our class discussions, but that era provided us with plenty of interesting events to discuss. Gary Powers was shot down in the famous U-2 incident during a semester when I was in one of Mac’s political science offerings. I was in another of his classes when the Berlin Wall went up. That had a special meaning for him, as Mrs. McMillen had been a war bride from Germany. She was kind enough to offer some of us German lessons in their home. Prof. McMillen had a way of imparting knowledge in a painless manner. You knew that if you were not prepared for class, he would not embarrass you—but you also knew that being prepared made the discussions much more enjoyable. His tests were comprehensive but fair; if you attended class and read the assignments, it would have been difficult not to receive a good grade. After Mac’s death in 1985, Mrs. McMillen started a small fund in his memory. I am hoping to increase the fund to a meaningful amount in order to create an annual award in his memory that would provide a stipend to outstanding faculty. If you would like to help continue Professor McMillen’s impact, please consider designating an offering to the fund in memory of Ken McMillen at West Liberty. The Kenneth B. McMillen Fund will be used for the purpose of creating a stipend for outstanding faculty in honor of Mr. McMillen. In recent years, the fund has grown through the generous donations of a few alumni who want to continue Professor McMillen’s legacy at West Liberty.